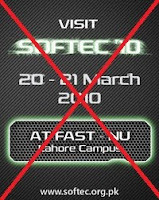 A sad news for all those who were participating or planing to visit the SOFTEC 2010 of FAST-NU Lahore campus is that SOFTEC 2010 has been cancelled due to current security conditions of the country and specially of Lahore. SOFTEC 2010 was planned to be held on 20-21 March 2010 but now its cancelled and we don't know yet if its going to be held this year or not. This news might be very frustrating for SOFTEC team members who were working so hard from last 8 to 9 months to make that event a success as usual but current blasts in Model Town and then in Iqbal Town forced the university management to take this hard decision for the larger interest of university and safety of SOFTEC participants and visitors. Well I am hoping to see this event back in action soon. You are right, it will be very stressful for organizers and participants to have the event canceled. Such events not only give an opportunity to participants to meet peers, but they can also showcase their work, learn new ideas, find encouragement -- and sometimes customers to commercially launch their projects. In past, we saw that PIQC Institute of Quality also had to postpone their International Convention on Quality twice -- first in November 2008 and then in March 2009. We wish and pray that security situation in our country improves so that we could see such useful events happening on regular basis. 34 days left to the Mega Event !! !